On the evening of Friday, September 21, Venus will reach visual magnitude -4.78, its maximum brightness for this year. Although the planet will exhibit a waning crescent phase in telescopes (inset), it will be that much brighter because of its closer proximity to Earth. Soon, it will be time to bid a fond adieu to the "evening star," the planet Venus. Since the end of March, it has been a very prominent object in the evening sky shortly after sunset, and it will reach its greatest brilliancy Sept. 21, low to the horizon. This summer, skywatchers have seen four prominent planets stretched across the evening sky soon after sundown: Jupiter, Saturn, Mars and Venus. By far the brightest of the four, Venus will exit the evening sky first, ultimately transitioning to the morning sky by the end of October. The goddess of beauty flames up to its maximum brightness a week from now, but that brilliance is tempered, because Venus has been getting noticeably lower in the southwest sky with each passing night. The interval between the time of sunset and the setting of Venus amounted to 1 and a half hours on Labor Day. This week, that interval will shrink from 75 minutes to 60 minutes, and by month's end, Venus will be setting a scant 45 minutes after sundown. The planet reaches greatest brilliancy next Friday (Sept. 21), shining at magnitude minus 4.8 and casting brilliant light from near the horizon. Venus will then shine 23 times brighter than Sirius, the brightest star in the night sky, and more than six times brighter than Mars was at its closest approach to Earth in July. Usually, the period from greatest elongation to greatest brilliancy is the best time to see Venus. But this particular evening apparition has been very poor, because Venus has been consistently low in the twilight sky. It was at its best back in June, when it was setting at around 11 p.m. Ever since then, however, Venus has been setting a little earlier each night. 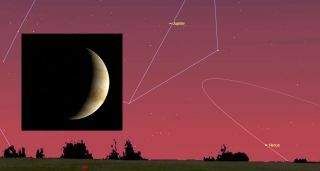 On the evening of the planet's greatest elongation — its greatest angular distance east of the sun, on Aug. 17 — Venus set just as evening twilight ended. But this is such a low-slung end of Venus' apparition for midnorthern latitudes that skywatchers located at around 40 degrees north latitude now find the planet terribly low. And it will be only about 7 degrees above the southwest horizon at sunset by the end of September. Recall that the width of your clenched fist held at arm's length is equal to roughly 10 degrees, so Venus will appear less than one fist above the horizon! Right now, the angle of illumination between the sun, Earth and Venus make Venus appear like a thin crescent. In the weeks to come, as Venus gets closer to Earth, our neighboring planet's size will increase, but as the angle of illumination gets smaller, the crescent will get progressively thinner. So, Venus will appear as an increasingly huge, thinning arc of light. You may be able to see it in binoculars over these next couple weeks, but it will be too low for a steady view. By the end of the first week of October, Venus will set only a half hour after the sun and then will disappear. The planet falls 6 degrees south of the sun on Oct. 26 at inferior conjunction, in line with the sun from Earth's perspective, so it will be well-nigh impossible to see Venus on those evenings or the mornings of adjacent days. But don't despair, for in November, Venus will sprout up into the predawn sky to begin a spectacular morning apparition. By the winter holidays, it will make for a very appropriate "Christmas star," shining high in the eastern sky and rising more than 2 hours before the break of dawn and nearly 4 hours before the sun appears. Joe Rao serves as an instructor and guest lecturer at New York's Hayden Planetarium. He writes about astronomy for Natural History magazine, Farmers' Almanac and other publications, and he is also an on-camera meteorologist for Verizon FiOS1 News in New York's lower Hudson Valley. Follow us @Spacedotcom, Facebook and Google+. Original article on Space.com.